Still occupying a very unique place in the sludge sub-genre, and still something like Kyuss meeting Pink Floyd via Sonic Youth, Georgia’s Kylesa is on its sixth full-length, and faces the difficult task of following an album up that showcased the band pretty much at the peak of its sound. After 2010’s excellent Spiral Shadow, it seemed difficult for the band to go much further, and indeed in some ways Ultraviolet is a retreat. Yet it’s a series of steps sideways as much as steps backwards, not least because this is the least metal the band has ever been, seemingly almost dropping the harsh vocals completely and allowing pleasant-voiced Laura Pleasants to take the majority of vocal lines. This doesn’t mean the band has moved too far from heaviness, of course – We’re Taking This especially is furious, raging vocals and psychedelic elements that shift colour from a hazy purple to a vicious black. Those psychedelic elements are dominant here, driving the album and making it a essentially collection of short little trips, from two minutes to just over five, as ever, yet it’s here that I really noticed the shortness and wished that the band had allowed certain moments to continue and reach their full potential. It’s a sign of great maturity to be able to say so much in limited time, true, but this should be allowed to breathe more than it is. There’s a dissatisfied, restless, perpetually-moving drive that hinders the likes of What Does it Take and Quicksand and leaves them feeling dangerously rushed, even like filler, by not giving them enough time to shine. At the album’s nadir, Vulture’s Landing feels a little too Kylesa-by-numbers, with a dull central riff and uninteresting vocal lines from Pleasants, even with a nicely spacey solo. Kylesa being a very skilled band however, these moments are fewer than they could have been. And let’s face it, this forwards motion means that even as you mourn one ended snippet of lost brilliance, it won’t take long before you’re celebrating a moment that works. The band’s considerable songwriting skills are hard at work – the languid Steady Breakdown is a moment of beautiful groove that uses its running time (just under five minutes) perfectly, for instance. The beginning of the album is its strongest, Exhale and Unspoken drawing you in with hooks and a balanced mixture of heavy riffs and intriguing sounds. Long Gone has the best use of drumming, with a lovely central double-solo, while Low Tide sounds like the world’s greatest indie band, intricate percussion and crafted clean vocals surrounding the atmospheric guitar lines comfortingly, while closer Drifting has enough going on from the heavy drumming (three drummers are credited with playing on this album, which seems dangerously close to overkill!) to the riffs to keep you listening. 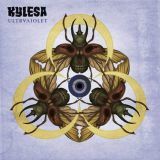 All in all, a more than decent effort from Kylesa, and one that’ll doubtless get many more plays in the future. Give the band its due, this is no throwaway, but a carefully crafted album. Yet it’s a step down in quality, and given just how full of exuberant life and instantaneously catchy an album Spiral Shadow was, not to mention how much better it filled the shorter tracks, it’s impossible to recommend Ultraviolet over it. Newcomers should go back and check Spiral Shadow out; but existing fans should give this album a chance, if be prepared to put some work in.